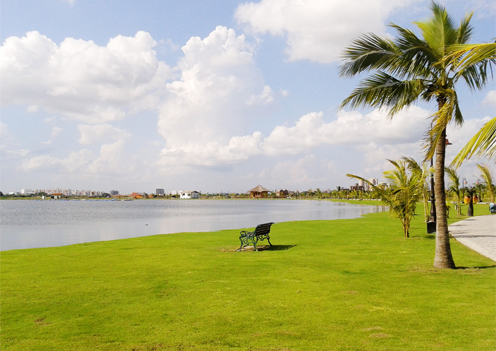 In the making of New Town, West Bengal Housing Infrastructure Development Corporation (WBHIDCO) outlaid 480-acre as recreational area – called Eco Park. Envisaged with a number of play features for children and adults and a variety of gardens around a lake, the project had a wobbly start but eventually emerged as a jewel in the WBHIDCO crown. Upon repeated failed attempts to implement the original Eco Park plan, WBHIDCO entrusted its design and planning to us. When we got this project, it had only nine months to deliver. Faced with the time constraint, we, as PMU, gave due consideration to the elements of the discarded master plan: analysed various constraints and worked out a plan for the entire area. Some of these issues were ignored in the earlier Master Plan. PMU supported WBHIDCO through planning, architecture, project management, civil engineering, ICT, marketing, financial analysis, security services and human resource planning in the making of Eco Park. The myriad aspects were looked into included the following, among others. PMU also developed pricing policy for all commodities in Eco Park, including for tickets, boat rides, entertainment activities, etc. Eco Park was commissioned on 29 December, 2012 and has since become an immensely popular destination on West Bengal tourism circuit with a daily footfall of 3745. Such is its popularity that over 70% of its O&M cost was recovered in the second year of its operations. Of this, 55% recovery came from the sales of entrance tickets. The client was satisfied with the inputs and went on to showcase Eco Park in many national and international platforms as a good practice.